The long and often painful way in which Frank Williams rose towards to the top step of GP racing is recollected in many books and articles, and the times the Williams team has been put forward as an example for all no-hopers dabbling around at the back of the grid are near to innumerable. The first year in Frank Williams' long and eventful GP history wasn't all that bad though. In 1969 Frank managed to strike a deal with Jack Brabham to provide him with the latest material from Motor Racing Developments: a pukka BT26A chassis, fitted with the engine-to-have, the Ford Cosworth DFV. Assigned to driving the car was Piers Courage, part of the eponymous brewer's dynasty and a gentleman racer whose talent stood out among his noble peers in motorsports. While the typical gentleman racer was racing for fun, Piers was truly obsessed by it. Grown up at Fitzwaters, the lofty Essex family home, Courage was an heir to an empire but declined the rights to the throne to go racing. He had been cursed by the speed genie when educated at Eton, a friend lending him a copy of The Vanishing Litres, a book on the Bentley team's Le Mans adventures. From that moment on he turned his room into a shrine to racing, the walls put out of view by volumes of Autosport magazine and the ceiling given a decorative chequered-flag twist. The smell of Goodwood paddock and the kick of throwing his mother's Minor around on a local airfield had him smitten once and for all. Piers became truly involved in motor racing when in a speed-addicts pub in South Kensington he met a guy called Jonathan Williams - the very same Jonathan Williams who was to receive an unexpected call-up from Ferrari in 1967. On July 2, 1961, the day Giancarlo Baghetti miraculously won the French GP in the FISA Ferrari, Jonathan and Piers met Frank Williams at a rainy Mallory Park and they were to join his circle. In 1962, Courage Sr still showed some leniency when he gave his son a Lotus 7 kit car but when things became serious, with Piers finally giving up accounting to devote himself to racing entirely, the son found himself without the support of his father. His mother stuck with him to the bitter end, though. With the help of his mate Jonathan Williams, Courage worked his way up to an international level by 1965, the pair driving Charles Lucas' F3 Brabhams. The Englishman's first F1 opportunity came in Tim Parnell's BRM but it was too early in his career to shine. He made a mark of himself by blitzing the opposition - including Jim Clark - in the Tasman Series in his self-entered F2 McLaren acquired from John Coombs. 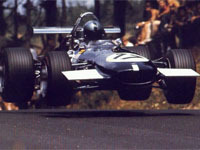 The rest of 1968 saw him do a full season for Tim Parnell, coupled with doing F2 for Frank Williams. Teaming up with his old mate Frank brought him infinitely more pleasure than driving the obsolete BRM and the pair was reunited in 1969 when Frank acquired a BT26 which was subsequently modified to DFV-spec by Robin Herd. After their Spanish debut went unnoticed Piers and his Brabham truly came to the fore at the Monaco GP where the combination finished runner-up to Monaco king Graham Hill. Granted, in a season where the GP organizers were happy when entry figures exceeded the 15 mark it was relatively easy to finish up in the points. But Piers showed his grit on many occasions and from his mid-grid positions managed to steer the Brabham to the front fairly often. Unfortunately, retirements were a common occurrance until Courage scored another 2nd at the US GP, picking up places as the front-runners - McLaren, Siffert, Stewart, Hulme, Beltoise, Ickx, Hill - all fell by the wayside. For 1970, Piers received a seemly irresistable offer from Ferrari. Perhaps wiser by the unjust treatment Jonathan Williams had received by the Scuderia in 1967 Courage turned it down and chose to stick with FWR. The decision may have lost us an almost certain Grand Prix winner.